Women don’t always attend GP practice saying they are menopausal. Instead, they can come in with a myriad of symptoms, which the GP has to be aware are linked, and to consider they may be climacteric symptoms. Often the women are prescribed antidepressants for their low mood, analgesia for their joint pains and anti-muscarinics for their bladder symptoms. Women are often relieved when all their symptoms can be explained by the menopause and using a symptom check list, such as the Greene Climacteric Score,1 can help them understand many of their symptoms they didn’t think to mention could also be explained. Menopause is diagnosed as 12 months after a woman’s last period. The menopause is based on symptoms in women without a uterus. There is no need for laboratory testing in women over 45 years.2 The symptoms are mostly due to lack of oestrogen in the body. Symptoms can vary between women, and the average length of time for symptoms is seven years. Although the commonest symptoms are hot flushes and night sweats, symptoms such as low mood, anxiety, memory problems, poor concentration and fatigue often have a more negative impact on a woman’s quality of life. Oral (not transdermal) oestrogen offers a small insignificant increase risk of stroke. Risk factors of cardiovascular disease are not a contraindication for HRT. This means that women with hypertension can still safely have HRT, the optimal preparation would be transdermal oestrogen and micronised progesterone. This can be given sequentially if she is perimenopausal and continuous if menopausal or if she has received sequential HRT for around a year. Oestrogen only preparations can come in gels, patches, and implants. Topical vaginal oestrogens can come in creams, pessaries and rings. Topical vaginal oestrogens can be given in addition to systemic HRT. A combined sequential preparation is usually prescribed if a woman has a uterus and has had a period in the last 12 months. This may come as a combined tablet or patch. It may come as an oestrogen-only preparation with an adjunctive progestogen i.e. Mirena, micronised progestogen. For the first 14 days she will take oestrogen alone and then for the next 12-14 days (dependant on the preparation) progestogen will be added to the oestrogen and she will subsequently have a bleed. Mirena is the exception as the progestogen is continuous. She may have regular periods again with this preparation. If she has a uterus, and hasn’t had a period for a year, she will usually be prescribed a combined continuous preparation, such as a tablet or patch containing progestogen and oestrogen. Or an oestrogen only preparation with an adjunctive progestogen such as Mirena or micronised progestogen. Vaginal oestrogen is effective for urogenital atrophy, including those already on systemic HRT.7 They can continue treatment for as long as needed to relieve symptoms. However, the symptoms often come back when treatment is stopped. Adverse effects are rare, but they should report unscheduled vaginal bleeding to their GP. They can also use moisturisers and lubricants in addition for vaginal dryness. If systemic HRT is contraindicated, advice should be sought from a health care professional with expertise in menopause. A woman is considered potentially fertile for one year after their last period if over 50 years of age, and for two years if under 50 years of age. Sterility can usually be assumed at 55 years old. Many women in their late 40’s will have a LARC or permanent contraception such as male or female sterilisation. 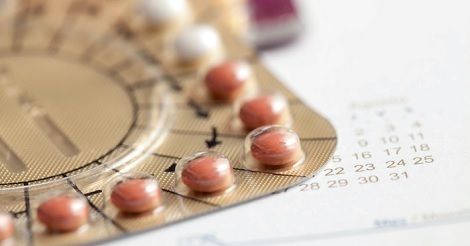 Combined hormonal contraception (CHC) is not advised over 50 as UKMEC3. Current recommendations are that injectable progestogens, such as Depo Provera or Sayana Press, is recommended only to 50 years old. However, other progestogen-only methods of contraception can be used up to 55 years of age, such as desogestrel pill and SDI (Nexplanon). However, they cannot be relied on for the progestogen arm of the HRT and need to be taken alongside the combined HRT. If a woman is taking continuous HRT and not having periods then she usually does not need additional contraception. After providing the initial prescription, follow up is usually after three months. Explain to women with a uterus that unscheduled vaginal bleeding is a common side effect or HRT in the first three-six months of treatment, but should be reported at the three month review or promptly if it occurs after the first three-six months. If symptoms are relieved, the method tolerated and no side effects reported, an annual review is advised. Annually, ask about any menopausal symptoms, monitoring cardiovascular risk factors, such as taking blood pressure, general lifestyle advice, check has contraception and discuss any relevant risks. Blood pressure annually is recommended only for cardiovascular risk factor monitoring. How long to prescribe for? NICE say that it is the women themselves who will decide, at some stage, if they wish to continue or discontinue taking it.2 There is no upper age or maximum length of time stated in the NICE guidance. Many women continue to take HRT in the long term because of the osteoporosis and cardiovascular disease risk reduction it affords.